The drinks include Prosecco, Beer and a selection of cocktails as well as Vodka & Gin mixers. I personally thought this was amazing as any other 'Bottomless' offers I've seen either have Prosecco and one cocktail or just Prosecco. This extensive menu provides a variety of options for guests and ensures that there is a drink for everyone. I did stick to just Prosecco but I'll definitely be trying a cocktail or two next time aswell! I also like the fact that you can mix and match between drinks and aren't limited to what you can choose! I'm not even exaggerating when I say that this is honestly one of the best roast dinners I've ever had. There is the option to either have roast chicken or beef with your roast and, of course, there is a separate vegetarian dish. I opted for the roast beef and it was delicious. 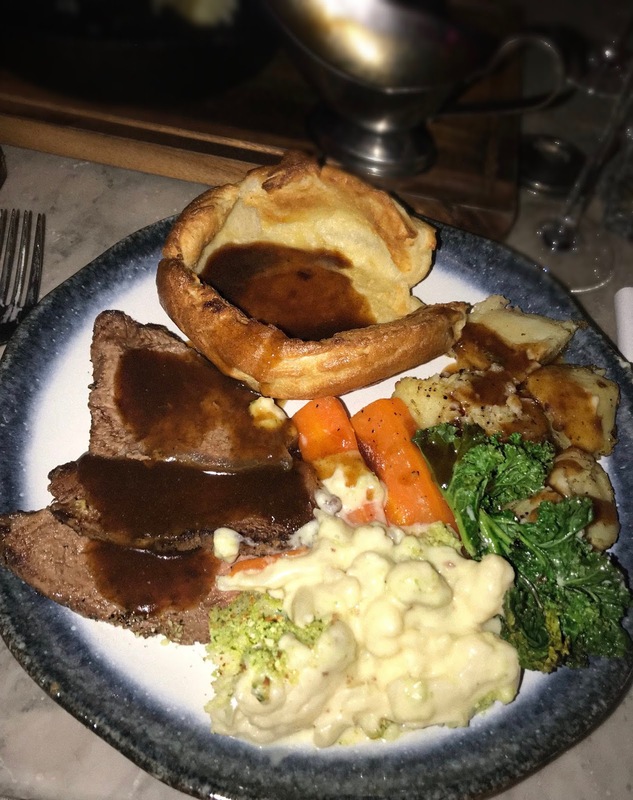 The above images show a meal for two; each person receives three pieces of meat, one large yorkshire pudding and a gravy pot each. There are then several roast potatoes, carrots and greens each aswell as a large portion of cauliflower cheese. This was the perfect portion size as I felt full but I didn't feel like I'd eaten too much to then continue drinking and enjoy the rest of my night. I loved the presentation - especially of the veggies. I loved how the cauliflower cheese came in a mini pan! Everything was cooked to perfection. I asked for my beef to be cooked medium and it was perfect. I think that this is an amazing deal and adds the 'traditional Sunday' feel to the standard Sunday club! I had so many glasses of prosecco within my 90 minutes and also ate a lovely meal. I would definitely recommend the Sunday Bottomless Roast to anyone looking for a trip out on a Sunday. Of course, the party continues and from around 8pm there is a live DJ and full Neighbourhood celebrations! If you do visit for the Bottomless Roast, I hope that you love it as much as I do! Where's your favourite place to go in Manchester?